Azad Kashmir was a world of beauty, splendour, tall mountains and green trees. “Papa! I love Kashmir! Can’t we live here forever,” Jahanara said innocently. Majid only laughed in response. He didn’t want to upset his little daughter by telling her that couldn’t be. Majid was an army officer. He got posted to new cities every two years. So far, Kashmir had been Jahanara’s favourite place. But she was only 11-years-old and had yet to see and explore most of Pakistan. Apart from the breathtaking landscape of Kashmir, Jahanara loved the place because of Afsah. She was the same age as her and lived in her neighbourhood. The two of them had known each other for just a few months and were best friends already. They also went to the same school. During the day, they were together at school, and in the evenings, they spent time playing outside. The two little girls shared all their secrets and laughed and prattled endlessly. They had become friends for life. Or so they told each other. “Afsah, I’m sorry. I didn’t do it deliberately!” Jahanara was almost in tears. “Go away, Jahanara! You ruined my favourite doll. I don’t want to talk to you,” retorted Afsah. Jahanara burst into tears and ran outside. She dawdled in the street, not wanting to go home. Her parents knew she was at Afsah’s house, she didn’t have to hurry home anyway. Sometime later, she decided to go and sit under the big tree at the backside of her house. She had never been to the tree alone; she only went there with Afsah. It was their secret place. No one ever came here and they decided never to tell anyone about it, not even their parents. Jahanara was puzzled to see Afsah already sitting on one side of the tree. She was confused all of a sudden, not knowing what to do. Afsah broke into a full-lipped smile when she saw Jahanara. Her anger had fizzled out. “I’m sorry, Jahanara. I shouldn’t have shouted at you,” she said. Jahanara ran towards Afsah and hugged her tightly. She knew that Afsah would forgive her. The rest of the evening they sat under the tree. The sounds of their laughter echoed in the mountains. They were so happy. “Ami won’t ever let me stay back. 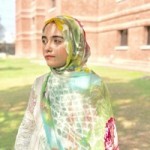 I don’t want to go to Lahore,” Afsah said sadly. “We’ll figure something out,” Jahanara reassured her, despite not knowing what she was going to do. Later that night, Jahanara made her mother talk to Afsah’s mother. By the time she put the phone down, Jahanara’s heart was pounding. Jahanara nearly jumped with excitement. She had never been happier before. Afsah was going to stay over at her place for some days. She had only imagined such a thing happening. Jahanara didn’t sleep that night. She stayed up and made a list of things that she was going to do with Afsah. This was her little dream come true. Heavy clouds appeared in the smoky sky on the cold late afternoon. It was going to rain. Jahanara and Afsah were at their secret place. Jahanara tried to climb the tree, while Afsah restlessly circled the tree trunk. Suddenly, the sky turned a shade darker, lightening flickered and rain fell. All conversation died out too. It was early morning on an ice-cold Saturday. Jahanara and Afsah were going to go out with Jahanara’s parents later that day. Jahanara went to the kitchen to get water, while Afsah was still in the room. When she was coming back, she felt a jolt. What happened next was unreal, nearly a scene drawn out from a film. Jahanara looked up and saw the walls and the roof breaking. Beneath her feet, she felt tremors. Suddenly, her lower body was crushed under the weight of the broken ceiling and bricks, and there was darkness. Jahanara screamed, but there was no answer. Her heart thudded madly in her ears. She was too confused to even cry. After a long time, Jahanara heard Majid’s voice. He asked her to keep talking and told her that everything was fine, and everyone was safe. A team of army men took Jahanara out from among the heap of bricks. Jahanara’s parents cleaned her wounds and gave her water to drink. Then Samina, her mother, asked her where Afsah was before the tremor. “I thought everyone was safe, Mama,” Jahanara said, sounding disbelieving. She told them where Afsah was, with misty eyes and her gut clenching. She wondered if she’d ever be able to see Afsah again. She trembled as she tried to fight waves and waves of terrible thoughts. It almost took an hour for the army men to recover Afsah’s tiny body. It was blue and bruised all over with no sign of life in it. Her lips parted, but no breath slipped past them. She was no more. Jahanara sat alone under the tree. 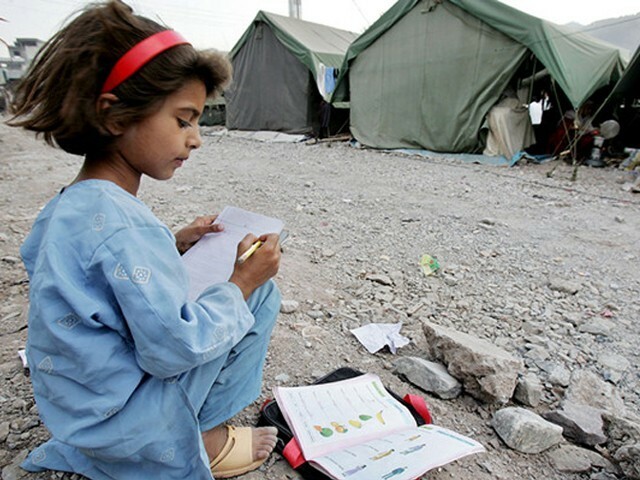 She felt alone at home, at school, everywhere, but not here. This was where all the memories of the past year would start echoing again. She wished she could go back in time and let Afsah go to Lahore. How different would everything be. Afsah would still be with her. Colours were fading from the sky as they were from her life. Jahanara looked at the empty blue sky and wondered if she’ll ever have a best friend again. This story is inspired by my friend’s heartbreaking story of how she lost her sister in the 2005 Muzaffarabad earthquake.